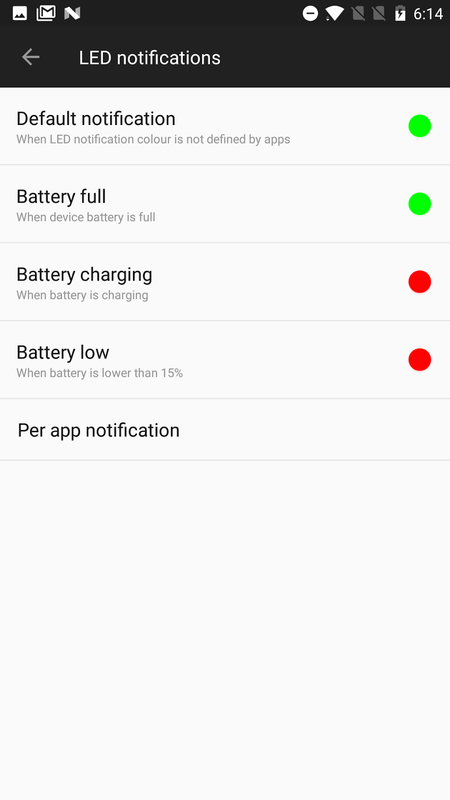 What settings do I need to get the LED to work on the Redmi Note 4? My phone keeps vibrating when the screen switches off. Make sure you are on Light Flow version 3.74.01 or above to fix this issue. Why can't I set the LED to be always on? Again this seems to be an LED driver issue. It's been common on most recent LG phones (Nexus 5, LG G4 etc) that the LED drivers won't accept always on timings. Light Flow therefore allows setting the LED to "nearly always on" where it will slowly flash but mostly be on. 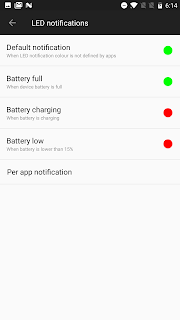 The most common issue is the phone settings, try going into your phone settings, LEDs and make sure only "downloaded apps" is switched on and all the other options are switched off, this will usually fix most issues. Go into your phone settings->security, notification access and switch off and back on light flow in the list. Go into your phone settings->apps(or applications)->select light flow and make sure "show notifications" is checked. 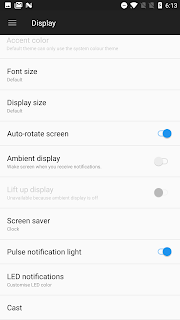 Go into your phone settings->display. Make sure your notification leds are enabled. Switch off your phone with the power button. Then switch it on again. Go into lightflow -> general settings and make sure direct mode is off. Then go into notifications -> missed calls. Set the color to "red"
Set the flash speed to "fast"
Press "test" Switch off your screen and wait 10 seconds. Does the LED light up? If not, try getting a real missed call as sometimes the test option is less reliable than the real notifications. If it still doesn't work, try to disable and then re-enable the notification and repeat the test. If that doesn't work, can you go into your phone settings, apps, choose lightflow and select "clear data" and see if that helps. There are varying degrees of success with other devices. 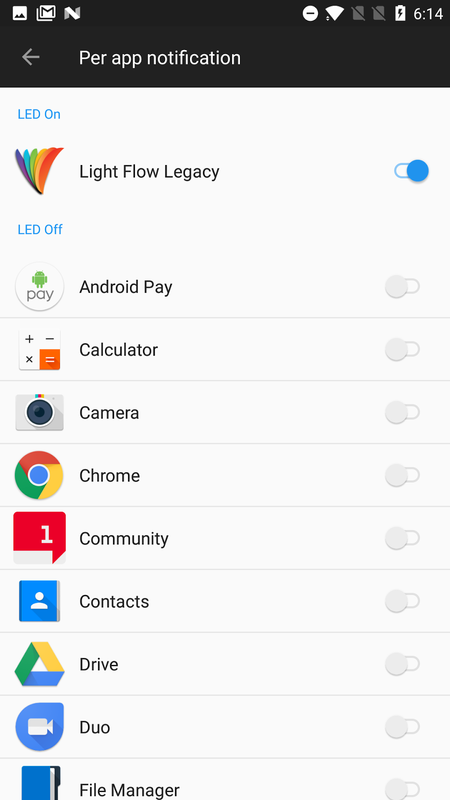 Go into your phone settings->accessibility and switch off and back on lightflow in the list. Go into your phone settings->security->notification access and switch off and back on light flow. Switch off your phone with the power button. Then switch it on again. Go into lightflow -> general settings and make sure direct mode is off. Switch off your screen and wait 10 seconds. Light Flow only controls the one central LED on the illumination bar, can it control all 3? Switch off "Main LED Control" and switch on "Illumination bar"
Then for each notification lightflow will use the new illumination bar option instead of the default color setting. This option allows for all three leds to be on and also allows for control when the screen is off. The led does not work, what can you suggest? If that doesn't work, can you go into your phone settings, apps, choose lightflow and select "clear data" and see if that helps. What settings do I need to test the app on the nexus 5? 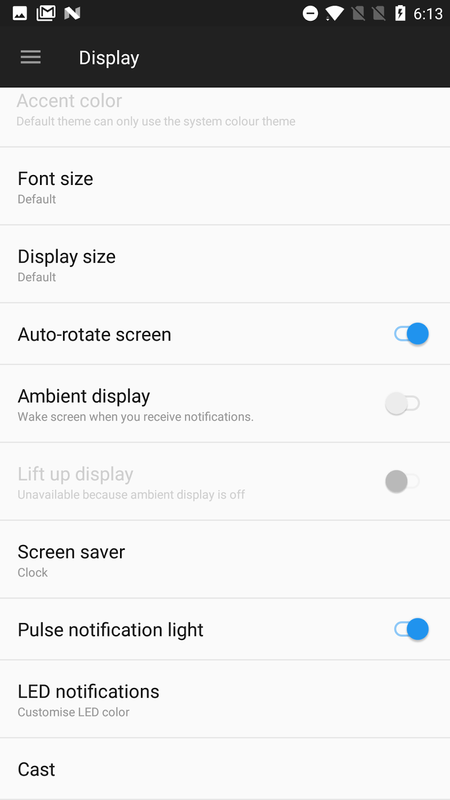 Go into your phone settings->display. 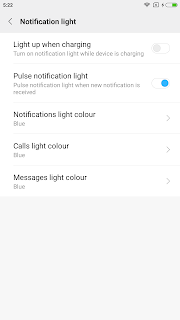 Make sure "pulse notification light" is checked. If it still doesn't work, try to disable and then re-enable the notification and repeat the test. If that doesn't work, can you go into your phone settings, apps, choose light flow and select "clear data" and see if that helps. Why do I sometimes for a small amount of time see a notification in the notification bar on android 6.0? Note in version 3.14.101 for sms to work you'll also need "hangouts - all notifications" enabled as well as "sms apps". This dependency isn't required in later versions. This seems to be a bug on the nexus 5 or in android 4.4 (kitkat). I've put a workaround in, but it'll only fire once the screen is off as android ignores led controls make when the screen is on. Note you'll get a quick red,green,blue flash after calls to and for the 1st subsequent notification to reset the led to working again. The drivers don't support always on so the app's had a small change to have an "almost always on" settings instead which seems to be the best the LED driver can support. My phone has updated to android 5.1.1 and now I just get a blue led. 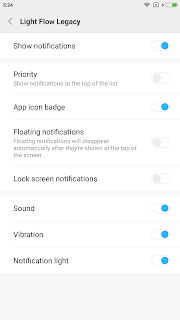 Try going into your phone settings, display, led indicators and make sure that "notifications" is enabled and everything else is switched off. 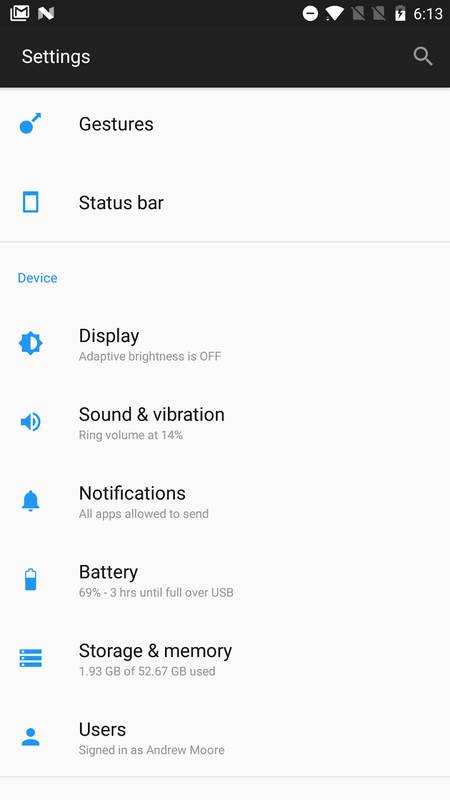 Also note that on android 5/Lollipop that the led won't show when the phone is in silent/mute mode due to changes make by google and samsung. Once android 5.1 comes to the phone it should start working again if samsung make the same changes Google have on their nexus devices. How do I set up my phone to get notification LEDs from Light Flow? Go into your phone settings->application manager->select light flow and make sure "show notifications" is checked. 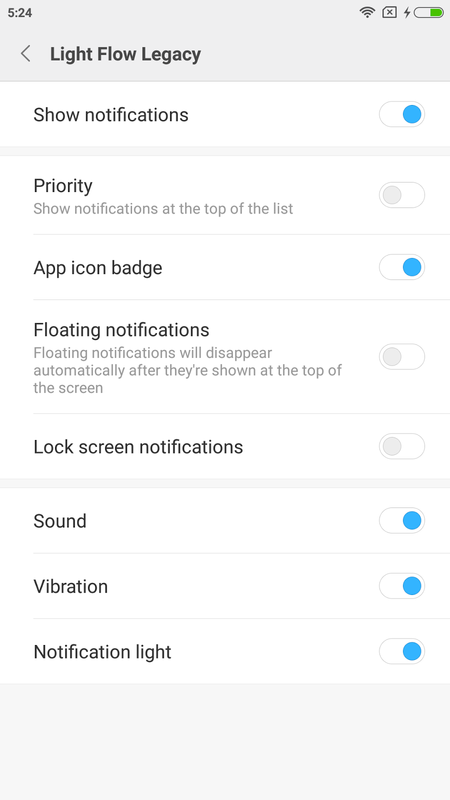 Go into your phone settings, display, led indicators and make sure only "notifications" is checked. Then go into lightflow, notifications, missed call and select the color red. Press the phones "home" key and switch off the screen. Then try get a missed call and see if the led flashes red. If that works, then settings other notifications on should generally work. When I try to switch on the accessibility service the phone warns me that it's going to switch off features such as Air View, Air gesture and a few others. Why do these need to be switched off? They don't, and most can be switched straight back on once light flow is installed. It's a bug in Samsung's accessibility service which causes this. Sadly the s3 mini doesn't have a notification LED in its hardware. Do you support the Illumination bar? From version 3.15.100 of the app upwards, yes. Note that there's quite a combination of LED types with these phones. Some just have a notification led, some have an LED strip across the bottom and some have both. Also some have only a white illumination bar whereas others have full color support. There are two settings that control these LEDs to enable or disable them. 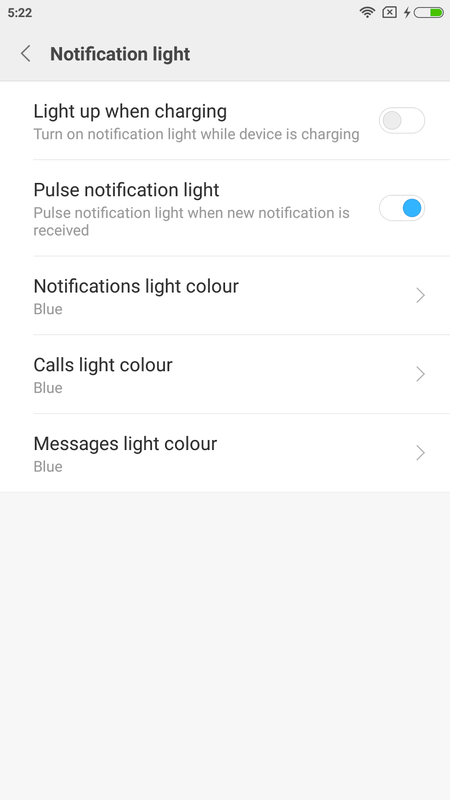 If your phone has both types of LED (such as the xperia U) then you can enable both and set them different colors for each in the notifications section of lightflow. If your phone only has an illumination bar (such as the xperia SP) then you've two options. Either enable "Illumination bar" and switch off "Main led control" or visa-versa. If you select Main led control then the led will work when the screen is off only. If you select illumination bar then the led will work when the screen is on or off. The Main led control will just light the middle LED of the illumination bar whereas the Illumination bar control will light all 3 LEDs. If you have both enabled, you may get a mix of both, but the illumination bar controls will generally override the main led color controls. Why does the app not work with stamina mode? This is something I'm looking into. Light flow can be "white listed" by adding it to the exceptions list of apps that are excluded from stamina mode. Note though that if your other apps that are raising notifications are not also in the list, they won't be raising notifications until when the screen is turned by on. Update: it seems that some phones now do work with it, or will put up a message saying that light flow will prevent stamina mode. I've just upgraded to Ice Cream Sandwich (android 4.0.4) and now the app doesn't work? I've had a few reports of this on several sony phones upgraded to 4.0.4. There are quite a few reports in general with the led on sony's support forums so I think it may be a bug in sony's recent rom upgrade. A quick google search on "sony 4.0.4 notification led" shows up lots of problems. Hopefully sony will fix it soon. I'm aware of custom patches for rooted users existing where users have fixed this driver issue sony have created in ICS. I just get a green light all the time, is my phone supported? 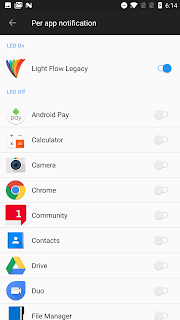 Sadly when HTC started using versions of gingerbread and above (android 2.3.x) on their phones they changed the permissions required to be able to access the LED hardware. Therefore "root" is now required to be able to control the LEDs. With root access, the app would most likley work in "direct mode". Note that most HTC phones allow for 3 colors to be chosen (the color limitation is due to the limited hardware in HTC phones). The colors being green and two shades of orange. Can I get the led to blink? We've had a few reports of this and are looking into the issue. 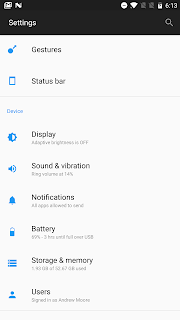 It seems like an LED driver bug in Lollipop but we will try and find a way around the issue. Make sure you go into your phone settings->display->Notification light->Front led and make sure "downloaded apps" is enabled. The LED's don't work at all. A few people have been reporting this. So far the only fix seems to be to do a factory reset of the device and choose not to restore existing apps when signing back up. I'm not quite sure why this is, but so far it's fixed the issue for 100% of people who've reported it. Is it possible to control the back leds? I select a color for gmail, but it always shows as green? I can't get the app to work, can you help? - Go into your phone settings->accessibility and switch off and back on light flow in the list. - Go into your phone settings->security, notification access and switch off and back on light flow in the list.